Ok I have a 1999 V70xc awd wagon. It is no longer awd and I am sick of everything being a cluster back there and so dam hard to work on. So I want to switch the rear end out of a fwd v70xc wagon. Can I do it??? And what years can I get the fwd rear end out off. Im shure I can..its the same frame. I would think. So need to know 1... can it be done with out a welder or anything crazy..2....what years will fit.(1999-2000)? Or more. 3....what model cars will work? (assuming only the wagons?) 4....would the back end off a xc model work? ( I use for carpentry so a higher back end is sometging I would not mind. )Thanks ahead of time to any answers and replies!!!!!!!! Actually mine is rust free(lucky me)....and it wouldnt be a custom fit if it is on the same frame I would think. Any answers to my questions? Or just sending demotivation? 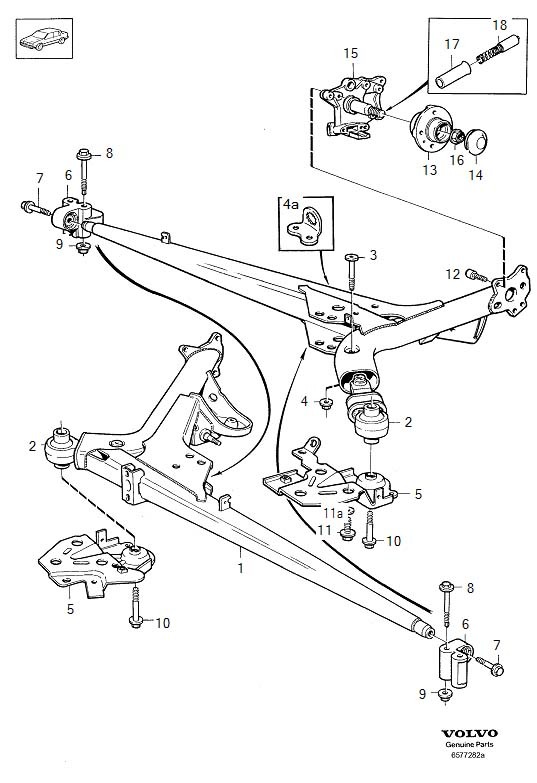 Look on the volvo parts webstore site to get the part numbers for the rear axle parts - one of the gurus will have to respond about if the frames for the XC and V70 series are the same. I don't think I have ever seen that discussed here or other Fora. I'm very familiar with the rear suspension and axle set up in 1997 850 FWD & 2001 V70XC AWD. AWD & FWD rear suspensions are two very different constructs. Unless someone says otherwise, how to mount a FWD's rear SUPPORT ARM to AWD mounting point, there is none. I'm fairly certain I've seen this discussed before, as I have a 2000 XC that is FWD (shaft and angle gear removed). The general consensus that I remember seeing is that it's a giant pain in the rear (pun?) and not worth the time and effort. I've thought about removing the axles, but you still need the speed sensor that is a part of the outer axle. Personally, I'm just not gonna mess with it. Why not just take everything and change 100% of everything that wears? New hoses, new fuel pump, new squishy bits for the suspension, etc. Probably cheaper, definitely easier, you'll have all new parts in there, and you won't have to think about it for the next 150k miles. You'll take it out of your sphere of worry, even if it is still a mess back there.